Home » Blog » Updates » What a Waste! One of the biggest challenges for this decade, and for many decades to come, is how much WEEE is thrown away. WEEE, you know… Waste Electrical & Electronic Equipment! That’s how much electrical and electronic equipment we throw away in the UK every year. Staggering. And, of course, as technology becomes more and more central to our daily lives, and the pace of innovation gets ever quicker, giving us smaller, bigger, quicker, cleverer, faster, quieter devices and gadgets to consume, there’s more to potentially throw away. In fact, there’s gold in them thar electronics, and lots of it, too. It’s just one of the precious resources lost whenever we fail to recycle our old electrical items and pile them into waste mountains or bury them underground. Oh, the irony, or should that be gold-ny? We can all do something about it. We can reduce the amount of waste we’re putting in our bins. Electrical items can be recycled at most Household Waste Recycling Centres (HWRCs). Drop off your old (maybe not so old) electrical equipment at your local HWRC and they’ll be sent on to Electrical Waste Recycling Centres. Here’s the cool bit, if an item cannot be repaired for use again (lots of items can be) it will be broken down into a wide variety of materials, including Gold, Silver and Zinc. Which then finds its ways into new items as diverse as jewellery and ships. Neat. We’re currently helping to spread this positive waste awareness message to pupils in primary schools across Wakefield. 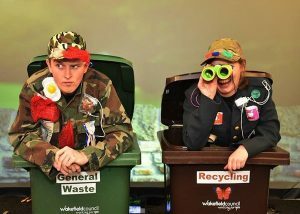 The Rubbish Show is helping to raise awareness and inspire young people to do something to reduce the amount of electrical waste we’re throwing away. Pupils are being encouraged to tell their parents, guardians and family members about the effects of waste on the environment, and to bring their old electrical items and equipment into schools, so it can be collected and recycled properly! It’s a great initiative, we’re proud to be promoting. Very informative and highly interactive presentation. Will highly recommend. Excellent – children loved it. Fantastic! Really encouraging for the children. The whole school were engaged throughout the show. A lovely, enjoyable and fun presentation that engaged and informed with lots of information. Really informative. Extremely entertaining. Engaged all pupils. Absolutely brilliant from start to finish! Needless to say, we’re delighted. It is a fantastically positive message to influence our younger generation (and their families) to consider the environment and help protect our lovely planet. We all need to do our bit. Feel free to drop me a line if you’d like to know more about our work with schools.